Ripple's XRP cryptocurrency and Ethereum (ETH) have long been battling each other for the #2 spot right next to the crypto king, Bitcoin (BTC), in terms of market capitalization. While the 2 runner-up cryptos swapped spots a number of times towards the end of 2018, Ethereum has remained in 2nd place for the whole of 2019. Ethereum seems to be winning the popularity contest, with its current market cap of over $17.5 billion compared to XRP's $13.8 billion. However, a different metric used to measure the rival cryptos' popularity shows another story. 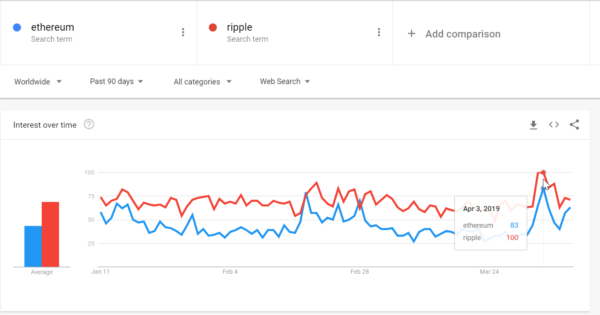 According to Google Trends, the number of worldwide users searching the term Ripple has been far greater than the number of search terms for Ethereum throughout 2019, indicating a greater overall interest in Ripple. Will Ripple (XRP) Surpass Ethereum (ETH) in 2019? For Ripple fans and XRP advocates, commonly referred to as the "XRP Army," the flippening of Ethereum by Ripple's XRP bank-friendly token is right around the corner. Since the beginning of 2019, the interest in XRP via Google searches is twice as much as the interest in Ethereum via Google searches. This could be used as an indicator of what's to come when the bull market really takes off and both mainstream and retail investors begin investing again. Moreover, apart from Google searches, the general interest in Ripple is noticeably high, as XRP fans can be seen all over social media platforms such as Twitter, Reddit, and Telegram. Therefore, as crypto prices begin to rise again, we can expect Ripple's XRP token to surge in value, especially since it's had relatively weak price action in comparison to other cryptocurrencies during the most recent run-up. Who's Most Interested in Ripple? Upon analyzing the Google Trends data a little further, it appears that the top 5 regions with the most Google searches for Ripple in descending order are Australia, the United Kingdom, the United States, New Zealand, and Denmark. On the other side of things, the top 5 regions with the most popular Google searches for Ethereum in descending order are Colombia, Argentina, Chile, Iran, and Romania. According to the data, Ripple seems to be dominating Google Trends more so in first-world countries, while Ethereum is dominating Google trends in developing countries. Generally speaking, people from first-world countries have more money to invest than those from developing countries. Therefore, it can be speculated that the wide majority of these people searching for Ripple have already invested in XRP or are thinking about it. It would also make sense that, as Ripple is aiming to disrupt the remittance industry, migrants living in first-world countries might search for XRP in hopes of finding a faster, cheaper way to send money back home. However, regardless of what Google Trends says, Ethereum is still the 2nd-largest cryptocurrency by market cap and has experienced a greater rise in price in 2019, from its yearly low of $103 to a yearly high of $181. This indicates a 43% price gain for Ethereum, while Ripple's XRP only experienced a maximum price gain of 19%. Do you think Ripple's XRP will surpass the market cap of Ethereum (ETH) due to increased interest from people around the world? Let us know what you think in the comment section below. You are subscribed to email updates from &quot;google trends&quot; - Google News.